Pop Culture Junk Mail: Burger Time tops the charts! Burger Time tops the charts! A great list of arcade music, including from "Frogger," "Burger Time" and "Pac Man." Man, just playing one or two of these audio clips gets me all nervous, like I need a joystick in my hand and to start moving little creatures before I get eaten or squashed. 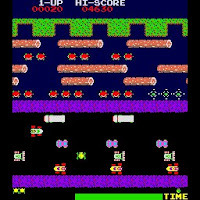 Oh, just hit that audio link for the "Frogger" music and see if you don't feel the same.